Interestingly, Facebook just popped up “memories” of last year’s gymnastics Halloween party as I was writing this post and considering copying it into an email to the owner. Sadly, this year’s memories are of a much different flavor. Maybe I’m over-reacting. Let me know. 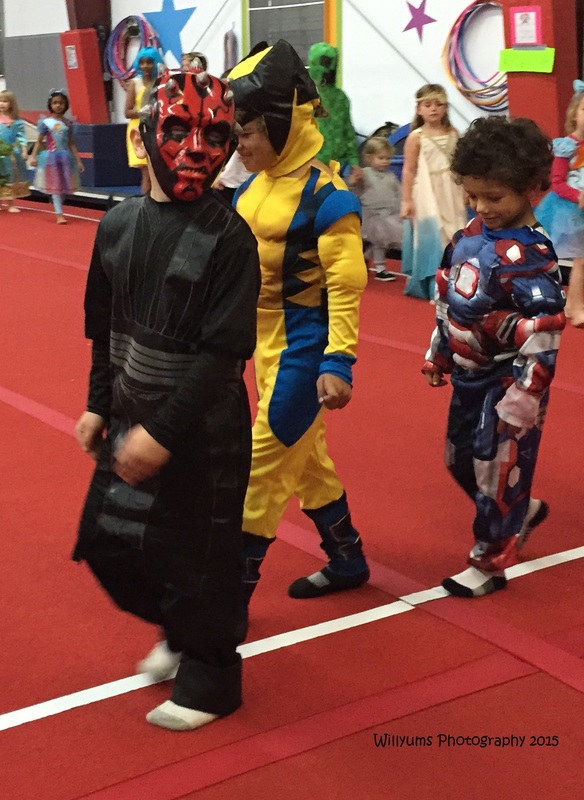 I am struggling with feeling so unhappy about how you treated my son during the Halloween Party at the gym last weekend. Yes, he was being loud and silly, wrestling with his cousin, as they got off the mat after the costume parade. But as he had rolled right over to my feet, I was about to correct his behavior when your booming voice and harsh tone sent my little four-year-old panicking into my arms. I comforted him and reminded him that he needs to be quiet, sit and listen, but I was a little surprised at your tone. When the owner of the gym came over to see why he was sobbing and if he needed encouragement to engage in the fun activities, I told her we were just taking a break, but the truth was that he was trembling and needed to calm down. Later when you returned upstairs and said to me, “Your boys are being too wild,” I wasn’t sure exactly what you were referring to. However, I didn’t get a chance to dialogue about it as you shortly thereafter yelled once more at my Little Guy. Having just exited the bounce house, he was unaware that you had proclaimed the tumble track off limits. Had you held your tongue, I would have walked over to my son and explained to him that that equipment was not to be used and we would have found another activity. Instead, it was clear to me that my family had been targeted in your mind as “trouble” and we weren’t going to have a good experience anymore. You certainly did not raise your voice to any other children or families – only mine and my sister’s boys. So, I gathered up my guys and we left early. You see, my children may look like “normal” children and they often act like “normal and active” little boys, but deep inside the brain there is a shift in the neurotransmitters and the neuronal connections which leaves them struggling with hyper-reactivity and very poor impulse control. It’s not a physical disability that you might see and have empathy for, it’s a mental one and clearly you have no empathy for a condition that occurred before they were born. But it is precisely for this reason that I have my boys enrolled in gymnastics, to teach them the skills of strength and self-confidence and self-control, all of which your employing gym espouses so frequently. Yet, your direct and harsh yelling shatters the self-esteem, demeans the child and breaks the spirit. Furthermore, your rapid discipline of my children when I am right there takes me out of the equation. I’m not sure if you think me too permissive or incompetent at parenting, but your actions were completely disrespectful. When my children are in class with you, then you have the authority. When they are at an event with me, I hold the authority. Unless they are in danger of hurting themselves or someone else, then it is my responsibility to handle their behaviors. Here’s what I expect of a teacher and a coach – someone who treats all people with respect and dignity. Someone who encourages a child to do their best and reach new goals. Someone who celebrates hard work and dedication. Someone who models what it means to be a strong, competent athlete and decent human being. Someone who works with the family to reach out to kids with unique developmental “challenges” and develop self-confidence, increase self-esteem, and develop sportsmanship. If you are unable to be that great coach, then we will find someone who can.